I've just graded a stack of papers handed in by computer science students. They were for the most part dreadful: written in chatty blog style, nothing referenced or the statement being referenced not actually to be found at the reference given, no evidence of any proofreading, even missing niceties such as page numbers or captions on figures. I'm not even going to start in on the missing structure of an academic paper. People, proper citation is not rocket science! And it is not an instrument of torture that instructors force students to use. We cite to give our readers a chance to follow our reasoning, to check up on us, and to demonstrate the research that was done. sum up in a phrase or a few sentences a whole article or chapter, a key finding/conclusion, or a section – you summarize. can honestly say, ‘I didn’t have to research anything to know that!’. If finding it out did take effort, show the reader the research you did by referencing it! That rather puts in a nutshell when to reference. But I find that my students don't even know how to reference. I had one paper with 14 URLs listed under the heading "Sources", but none referenced from the text. Do you expect me to look through all of your URLs to find where you got the notion that Alan Turing used a Turing Machine to break the Enigma code? Many papers had one reference (usually given as a footnote number!) for each paragraph, so I am probably to assume that they took the entire paragraph from this source. One paper used "vgl." (German for "cf.") in a footnote for every single reference given. No, that means that there is more information about this topic to be found there, not that you took this snippet from that source. As a computer scientist, the structure of referencing something appears so simple to me. I use this in the talks that I give, and a recent attendee asked me if I had published it anywhere. I actually haven't, because it seemed so obvious. But here it is, in case anyone wants to use it! Where does it start, where does it end, where did it come from? If you use something by Smith in the next sentence, you can use something like "Smith continues..." or "Additionally, she feels ..." or some such for making it clear that it is still Smith talking and not you. Was that really so hard to understand? One last word of advice: Don't quote the Wikipedia! It's a great place to start your research, and then you look up all those cool references at the bottom of the page and use them as your references. If the Wikipedia is wrong, please fix the article for the next people wanting to know about the topic. Only if you are doing research about the Wikipedia should you be quoting it. 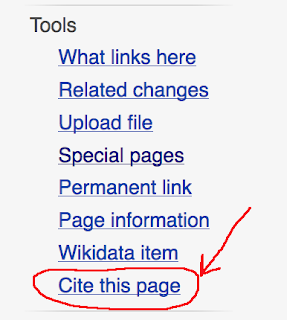 And if you must, please use the "Cite this page" link! It's on every page but the front page of every single Wikipedia. And it will give you a proper reference to copy in many popular styles. Debora, you can't expect people to know how to do something, if they've never been taught it. If we value academic referencing, then we need to teach it to the students. But there are soooo many books out there on how to write academic papers. I do expect that a university student would be able to find a book on a topic they don't know something about and read it. But students should know about this before coming to university: In Berlin the topic of correct citation is to be discussed and practiced in German class in the ninth grade in school. Great, Writing Boot Camp. Next thing it becomes a lecture and you can get credit points for taking it. Seriously. For me, the whole purpose of an academic education is getting you in touch with science. This includes formulating hypotheses, doing research, learning formal methods and yes, writing something down in the established and widely accepted way. If you can get one semester close to your thesis without having learned even the basics of writing then something went horribly wrong. Then you totally missed the point and should probably turn around and start over. (I am exaggerating a bit. Sorry.) But if I read your article correctly this is now the default for students? I am shocked. I would be interested why your students "don't read academic literature"? Because if you do you inevitably get a feeling for the correct way of writing. This is not restricted to citation and references but also on creating a sound structure and finding the right tone. I once attended a lecture where we were required to read one paper a week and then discuss it in class. At that time I was mainly focused on the topics (algorithmics class, very complicated) and I only later (when writing papers myself) realized how much I had soaked up during the course. I think scientific writing (at least the basics) is not something you should explicitly learn but something you should just get used to during your studies, without even noticing. Seems like this does not happen. Sad. I work for an academic publishing house (I don't have authority to speak for them, since I'm just their technical editor--if you want details, private communication is best for that, but I'm happy to back this up). Even people with PhDs seem to have never learned what to cite or how to cite it. Even in the (theoretically) more ethical Christian academic market, one major scholar has had almost his entire corpus discredited for plagiarism--see Zondervan, Eerdmans, and InterVarsity on six retractions of Peter O'Brien's work. Our imprint had to take similar preemptive steps recently and replace all the footnotes in a volume before release. We take citation very seriously, but unfortunately in the United States, very few people have ever been taught how to properly cite--and fewer care at all. Thanks for your hard work on these matters. I miss Beall's List dearly for Jeffrey's work on scholarly predators. Helped my job as a bibliographer so much.